The tale of the rise and fall of M. Night Shyamalan is so well known by this point, it’s almost become a cautionary fairy tale. We know of his highest highs with The Sixth Sense and Unbreakable, and of his lowest lows including (but not limited to) The Last Airbender and After Earth. It’s a story of a filmmaker believing far too much in their own hype and becoming so wrapped up in themselves that he soon fell out of grace with critics and audiences the world over. If movie moguls were to publish a new book of children’s stories, it’s likely that The Tragic Tale of Shyamalan will feature heavily. However, most heroes in these stories manage to pick themselves back up after falling spectacularly, and try again to the best of their ability. Shyamalan does exactly this with The Visit, which seeks to go back to his early horror roots where his path from rags to riches to rags again were planted – but is it a heroic return for the fallen hero? The film, shot and presented in the style of a work-in-progress documentary by aspiring young filmmaker Rebecca (Olivia De Jonge), follows her and her brother Tyler’s (Ed Oxenbould) week-long stay with their estranged grandparents while their mother (Kathryn Hahn) is away on a trip. At first, Nana and Pop Pop (Deanna Dunagan and Peter McRobbie respectively) seem like sweet old people, but when the children become curious by their elder’s 9:30pm curfew, they discover that their strange behaviour is anything but sweet. An investigation into their disturbing nature leads to a twist that we certainly won’t give away here, but certainly doesn’t help the children’s case. The Visit is a bizarre mixture of all the tropes that Shyamalan has become known for, and a self-aware examination of them going on in the background. Characters still tend to speak in long-winded paragraphs of mostly wooden dialogue (despite the whole thing being shot in a supposedly naturalistic method), but their unnatural behaviour is addressed either in passing or, in their grandparents’ case, investigated thoroughly. There are moments that threaten to slip into unintentionally funny territory, but then they’re followed up with shots or one-liners that are actually meant to raise a laugh. It’s as though Shyamalan has realised what a joke his career has become in the eyes of many, and has decided to simply have fun with his own conventions rather than reinforce them. With this in mind, for a filmmaker whose sense of humour seems to have been entirely missing for the majority of his career, it’s relieving to see that he’s finally having fun as opposed to being serious all the time. By most measures, this is certainly Shyamalan’s most engaging film since perhaps Signs back in 2002, but that statement still comes with some serious reservations. There is still a disregard for the key “show-don’t-tell” rule of storytelling for a visual medium (characters note out loud simple acts such as opening the door, even as they’re filming exactly that), and the tone is wildly inconsistent as it flows heavily between a comedic adventure and a haunting psychological thriller. Everything that made his career sink in the first place is present here, and your enjoyment of this film will depend entirely on your tolerance for Shyamalan’s particular style of filmmaking and whether it’s still something you can stomach. However, the film lacks the overwhelming pretence of some of his other films, and though it is certainly present for a number of scenes it’s extremely dialled down in comparison to what came before. Shyamalan even pokes fun at his own pretentiousness as a filmmaker, with Rachel being a core representation thanks to her endless preaching about her filmmaking like a student at a prestigious and snobby film school. In its place is a relieving sense of humour, mostly coming from Oxenbould’s obnoxious younger brother (oh, and he raps quite a bit in this movie – you’re welcome/you have been warned (delete where appropriate). It’s probably the closest we’ve gotten to in years to a sense of competency in a Shyamalan movie, and if The Visit is any indication then this fairy tale might have a happy ending after all. 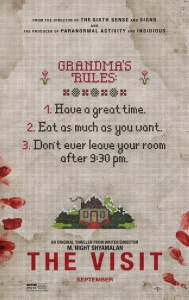 The Visit is a serious upgrade from previous M. Night Shyamalan disasters, and though some of his more laughable tropes are still present the relieving self-mocking nature provides some unexpected entertainment.